Online video is a misunderstood area of content marketing. There are myths out there that video is expensive and only for large companies. It is seen as a complex and highly specialized form of marketing when, in fact, it can be done by anybody. With the price of equipment and software decreasing while quality increases, online video is quickly becoming more common in marketing campaigns. Since people’s attention spans are shortening, it is even more important they are hearing your message. Video can also be great for showing viewers what is hard to describe with text alone. Whether you are going to read off of a pre-made script or will be going off of talking points, this step of the process is already done. You have your blog written; now you just need to choose what you are going to say into the camera. It's important to remember you only have the attention of viewers for a limited time. To capitalize on this, present them with the main points and give a quick summary of these points. To give you an idea of the time you have to work with, 155-175 words is equal to about one minute of video. A great example of this is the video Shannon created to accompany her recent blog “Enterprise Content Marketing: 5 Steps to Creative Content Approval." Once you have an idea of what you are going to say into the camera, it is time to record the video. Once you have the video recorded, it is time to add visuals. Using compelling visuals, such as slides, pictures or even other short video clips (typically called b-roll), can help keep your viewers’ attention. These other visuals help break up the monotony of a static picture. They can show examples of what you are talking about, a process that is difficult to describe or just give a different view on your subject. The more compelling the visuals, the better chance you have to capture and keep your viewers’ attention. This might sound like an easy thing to keep in mind, but in my experience, I have seen even the most outgoing people freeze up in front of a camera; there's something about a camera that makes people self-conscience. My biggest tip is to relax. Don’t be afraid to talk with your hands, say words like “uh” or “um,” or show emotion. This will help bring across your personality and humanize the video, enabling your viewers to connect with you. If you think you will have a little trouble with this, stand in front of a mirror and practice. You will find the more videos you shoot the more natural this will become. 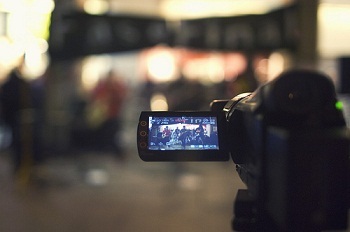 Video is a great way to summarize your blog posts and capture the attention of your readers. It is also quickly becoming an excellent marketing tool. With the accessibility of professional video increasing, there's no reason why your company should not be looking into its benefits. What tips do you have for creating a video out of a blog post? Share them in the comments below! With a degree in Electronic Media, Dan Romanski has five years of video production, both professionally and independently. When he is not assisting with projects at Kuno, he can be found exploring different parts of Cleveland with his camera. Connect with him on LinkedIn.